Welcome to the Digital Edition of the February 2015 issue. • Newsmaker — Walmart’s Dan Bartlett says it’s a new day at the world’s biggest company. The retailer is committed to paying all its workers above the minimum wage and vowing to be the leader in the coming retail revolution. 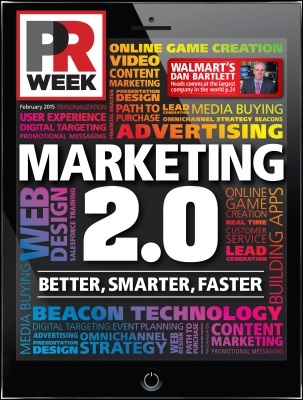 • Marketing 2.0 — Better, smarter, faster — From the latest beacon technology to finessing insights from big data, today’s marketers have more tools than ever to build the customer relationship. These tools demand precise strategic execution and the pressure is at an all-time high for CMOs and comms pros. PRWeek talks to industry pros about what works and how to avoid marketing misfires and spotlights marketers who are scoring gold for their brands. • Analysis — The widespread and wildly under-reported issue of sexual assault on college campuses has made it into recent headlines. Comms pros give their insight into handling this difficult situation effectively. • Market Mindset — Owen Cullen, MD at Cullen Communications, discussed the communications landscape in Dublin and how it’s becoming increasingly like Silicon Valley. Target’s PR director Katie Boylan explains how the city’s large, diverse corporations and small environment benefit local PR pros. • CMO Q&A — Informatica’s Marge Breya talks about how data will change customer relationships and which organizations use it best. • CEO Q&A — Anna Maria Chávez discusses how legacy brand Girl Scouts of the USA is leveraging digital to stay relevant.